The history as reflected below, was compiled from various write-ups and conversations and much digging and browsing through piles of dusty documents by André Engelbrecht and his wife, Amorita. At the same time, Johan Hattingh, Richard Holmes, Allan and Linda Casey, Wynand Smith, Deon van Zyl, Godelieve Nijs, Anton Bellingan, Peter Stelling, Anna Smith and Audrey Poole all contributed memories, as they recall them. Thank you to each of you for your contribution. We know that there is much, much more knowledge and information locked up in the treasure chests of the memories of our members. We urge all members to delve into those memories and to please share them with us – stories and photos of times gone by. I will be happy to receive them and to publish them here on our website in order to preserve them for generations to come. Johan Hattingh started working for Midmacor in 1982. It had an industrial division and a motorcycle division at the time. Midmacor was an affiliate of Bonuskor Ltd and Bonuskor was an affiliate of Federale Volksbeleggings. In 1983, Johan was asked to take over as Marketing Manager of the Motorcycle Division. He received a car and a “company” motorcycle, namely an 1100 Gold Wing. There were several Honda centres across the country which belonged to Midmacor. Honda Cape Town was run by Pat Goodall. Honda Centre Durban and Honda Centre Pietersburg existed and Kowie Smit managed Honda Centre Johannesburg. Only Honda products were sold by these centres. There were only two colours available for the 1100s, namely blue and burgundy. A Honda Gold Wing’s price in those days was R5 999, which was a lot of money. As time went by, Gold Wing owners from all over South Africa became known to Johan – among others, Lionel Muntz, George, Wollie Wolmarans (Pietersburg), Chris Bauermeester (Cape Town), Peter Barnard, Danny Kirsten, Quintin van der Merwe (who rode a red Gold Wing) and John Cole. 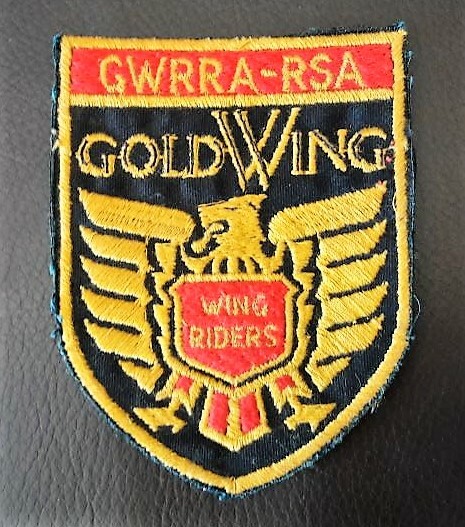 Some people were members, in their personal capacity, of the Gold Wing Road Riders Association (GWRRA) in America, but no club yet existed in South Africa. In 1983, Johan offered to take the initiative and organised a get-together for all Gold Wing owners in South Africa. The decision was taken to go to a place centrally located and the choice fell on the Joey’s Resort at the P.K. Le Roux Dam at Van Der Kloof in the Free State over a weekend in October. About 30 motorcycles gathered for the occasion. This first Gold Wing-involved rally, together with all the excitement thereof, also proved to be a thoroughly enjoyable event at a lovely and suitable venue. 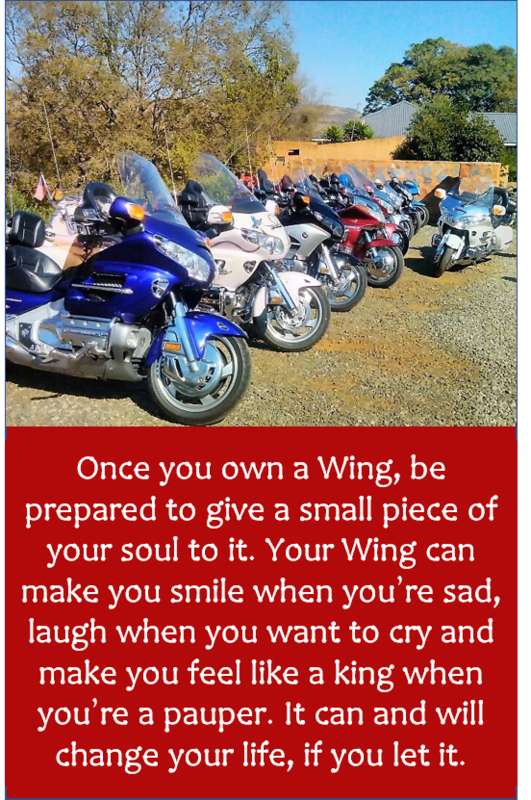 Gold Wing riders from all over South Africa had been invited and strangers soon became friends and the camaraderie that developed made one proud. A general meeting was held during this get-together at Van Der Kloof where Johan Hattingh proposed, because of the cost and the returns for South African members of GWRRA not being very good, especially when it came to recruit new members, that a South African club be created, exclusively for Gold Wing owners. They would have had the backing of the mother company and the backing of Honda SA. After some discussion on pros and cons, this proposal was unanimously accepted. Thus, the birth of a Club. It was proposed and accepted that it be called Wing Riders of South Africa and each province with a club would become affiliated. A National Council was then elected with a President at the helm to co-ordinate and maintain continuity in the provinces. The Council was to be elected on an annual basis. Johan Hattingh was elected as the first President and the rest of the committee members were Danny Kirsten as Vice-Chairperson, Quintin van der Merwe and a fourth person. It was also proposed and accepted that the Club would have an annual rally called a Wing Fling and that each province would have a turn in organising and hosting it. On the return trip to the Reef after the rally, Johan Hattingh and company called in at the Rob Ferreira Resort at Christiana and laid the foundations for the first Wing Fling to be held in 1985. In 1984, Johan Hattingh decided to bring in the newly launched 1200 Gold Wing, but his management consented to import only five motorcycles. One was a demo model which Johan used, one went to Wollie Wolmarans in Pietersburg, one to Ampie Woest in Springs and the other two were sold. Johan Hattingh designed the first badge of Wing Riders SA (when the Association was still going to be a chapter of GWRRA and he also wrote the first Constitution with the assistance of the legal team of Midmacor. The initial idea was to rotate the National Council of Wing Riders SA from chapter to chapter in order to give everyone a chance to be part of the management of the club. Up to 1985, Midmacor subsidised the Wing Fling accommodation and prizes were sponsored by Honda Centres. Honda and Honda dealers were actively involved with all Wing Riders’ activities. In 1986/7, Johan Hattingh won the Total Economy Race with his 1200 Aspencade, the best on fuel efficiency in the world. 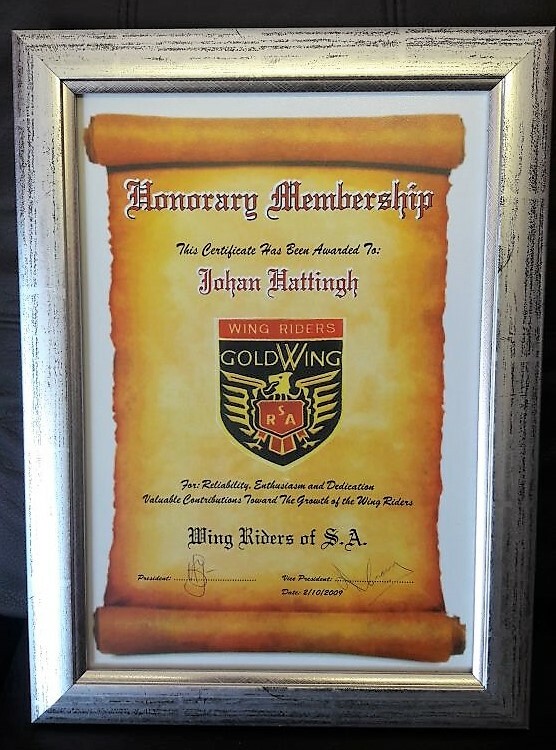 In 1987, Johan Hattingh was elected as Honorary President of Wing Riders SA and he became an honorary member in 2009. On the photo of the first Wing Fling, all the motorcycles were 1100s, except for Johan Hattingh’s 1200 Aspencade right in the middle of the photo as well as Ampie Woest’s 1200. Early in 1985, plans were initiated for the first Wing Fling to be held at Rob Ferreira Resort near Christiana in October 1985, where about 64 Gold Wings attended. The following year, 1986, the Wing Fling was once again held at the Rob Ferreira Resort. The Western Cape discussed the option of having a Wing Fling in Cape Town in 1987 and to make it worthwhile for the members from the Reef, Natal, East London, Port Elizabeth and Free State to attend, a programme for a week-long event was arranged and presented to members at the Annual General Meeting. It was accepted and hence the 1987 Wing Fling was held at the Ritz Plaza Hotel, Sea Point, Cape Town, where 75 Gold Wings attended. Since then, the Wing Fling has continued to be a week-long event. For more information about the History of the Wing Fling, please click HERE. It was a great surprise when the archives of the Club were scrutinised to find documentary proof that at one stage a Closed Corporation (CC) was registered with the name WING RIDERS OF SOUTH AFRICA CC in 1991 by Hugh Monson, as a non-profit motorcycle club. From correspondence in the archives it emerged that when the Western Cape Chapter was established, it was never brought to its attention that in fact a CC existed with the same name. The matter caused some stress among members and even attorneys were called in to resolve the differences among members and clubs. A quick search on the Cipro webpage revealed that presently no such closed corporation exists any longer. A letter dated 30 September 1999 from the Bureau of Heraldry confirms the registration of the club’s name and logo which was registered under Government Notice No. 1125 in Government Gazette 20476 of 23 September 1999. In the archive, a facsimile dated November 1998, was found in which reference is made of a Zimbabwe Wing Ding that was to take place from 3 to 11 April 1999. Thirty-six participants are listed. Jacques van der Westhuizen confirmed that it did take place and regard this trip to Zimbabwe as one of the best holidays he and his late wife, Letha, ever had. Unfortunately, it ended on a sad note as Rita Richter was killed instantly on the way back when the rear wheel of their Gold Wing deflated and they left the road. The first GL1500 brought into South Africa in 1989, was a 1988 Aspencade owned by Tom and Phil Marquis, two lovely people from England who immigrated to SA, settling in Brackenfell in the Western Cape. Tom subsequently suffered a stroke, which physically incapacitated him, but being a strong person with a positive outlook who enjoyed biking, had an enclosed Watsonian sidecar built in London that he had fitted to the 1500. Phil then had to obtain her driver’s license for a sidecar. This bike built up quite a history since its introduction to this country and has, since the sad passing away of a true biker, Tom, became the proud possession of three other Western Cape members. First Wynand Smith and then Harry and Wilna Wium of De Doorns and thereafter Richard Bokelmann. We have no knowledge of the current whereabouts of this motorcycle. In 1983 two excited young guys, complete strangers, Nico Barnard and Richard Holmes, both with one thing in common – their love for motorcycles, each became proud owners of the best touring motorcycle in the world, the Honda Gold Wing GL1100. They met at the Honda Centre, Bree Street, Cape Town, to take ownership and collect their dream bikes – Nico, a Honda GL1100 Interstate, and Richard, a GL1100 Standard. Pat Goodall of Honda Centre, an old friend, requested that they go and enjoy a cup of coffee, as the bikes were not quite ready and would take about another half an hour. They then made their way to a restaurant with all the excitement of discussing the bikes over a cup of coffee. Nico suggested and discussed the merits of creating a Gold Wing chapter in the Western Cape. Richard immediately agreed and found it an exciting idea. After returning to Honda Centre, they met up with Chris Bauermeester, a traffic official just visiting the Honda Centre at that time, who was the owner of a 1976 Honda GL1000. He was quite excited at the prospect of a chapter and stated that he would be available and assist where possible. They then approached Pat Goodall with this proposal. Without any hesitation, he stated that he was in favour of the idea and that he would, where possible, back us with the creation and stated that Honda Centre would also sponsor the chapter by paying the costs of all newsletters and correspondence relating to the chapter. He and Chris, through the Traffic Department, then supplied us with a list of names of other Gold Wing owners. Honda Centre forwarded invitations to all listed owners of Silver and Gold Wings to attend an inaugural meeting at the Kimberley Hotel in Roeland Street, Cape Town, in September 1983. On the night of the meeting, eleven bikes turned up. After welcomes and introductions and settling down with some liquid refreshments, they then got down to discussing the formation of a club. Nico proposed that this club should join the American Club GWRRA (Gold Wing Road Riders Association) and become a chapter thereof. He explained the principles and aims of GWRRA, an international organisation with chapters all over the world. He also explained that once a year GWRRA chapters all over the world hold a rally called the Wing Ding, which is their annual highlight. After further discussions, the proposal was unanimously accepted and the club was named GWRRA Western Cape. The cost of the membership at that time was $30 each and opened the world to any member touring, by enabling him to contact other members wherever and he would be welcomed, assisted and hosted on his travels. They then decided to hold a meeting the first Thursday of every month at the present venue and a club run was to be organised every third Saturday of the month. A committee was elected with Chris Bauermeester being the first Chairman and the chapter was to be run under the conditions and constitution of GWRRA, once the South African chapter was accepted as members. The SA chapter was accepted before the end of 1983. In 1984, the GWRRA Western Cape Chapter was invited by the Reef and Natal Chapters of GWRRA, who had established themselves in 1981, to attend their annual get-together. Nico and Anne-Marie Barnard, Chris and Pat Bauermeester, John and Ann Cole (who had joined our chapter prior to the invitation) and Richard Holmes (four bikes) met at Chris’s house in October 1984 and went to the Wing Ding where about 50 bikes attended. On the long trip, the Gold Wing proved itself to be a magnificent, reliable and comfortable tourer, doing just over 2 500 km in four days. At the beginning of 1985, all provinces received invitations from Johannesburg to join the new club called Wing Riders of SA. 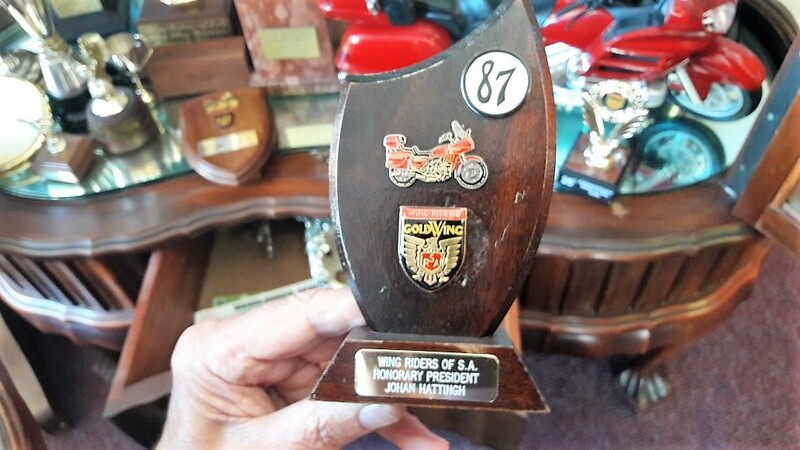 A number of riders immediately joined, but there appeared to be lethargy by the other Western Cape GWRRA members to form a regional club of Wing Riders of SA, which in some way frustrated a very keen and enthusiastic John Cole, who was becoming deeply involved with the club. He then took the bull by the horns by sending out invitations to all local subscribed members and other Wing Riders to attend the inaugural AGM at his house on Thursday, 1 August 1985 in order to get the club up and running. Thereafter monthly meetings took place on the first Thursday evening of each month at John Cole’s house and a bike run was organised for the third Sunday of each month. The first run was to Franschhoek. A monthly newsletter was published for the region. John Cole proved to be a very enthusiastic and committed Chairman and held the post for nine years before handing over to Morris Brown who held the post for four years. He was then replaced by Wynand Smith who held the post until 2004 when he stood down and Richard Bokelmann took over for one year. Anton Bellingan was voted in as Chairman at the AGM in November 2005. In 1985 plans were underway for a group from Western Cape to attend the first Wing Fling at Rob Ferreira Resort near Christiana in October 1985, where about 64 Wings attended. The following year, 1986, the Wing Fling was once again held at the Rob Ferreira Resort. As a region, the option was discussed of having a Wing Fling in Cape Town in 1987 and to make it worthwhile for the members from the Reef, Natal, East London, Port Elizabeth and Free State to attend, a programme for a weeklong event was arranged and presented to members at the Annual General Meeting. It was accepted and hence the 1987 Wing Fling was held at the Ritz Plaza Hotel, Sea Point, Cape Town, where 75 Gold Wings attended. to add hereto, in order to have a broad overview of our club’s history.